Ohno, Kimio - Component of : Early Ideas in the History of Quantum Chemistry. Kimio Ohno , Japan, was born in 1926. He graduated from Tokyo University (Faculty of Science, Dept.of Phys.) in 1951, consequently became Research Assistant of this Department in 1952. Per-Olof Löwdin from Oct. 1963 to Aug. 1964. Kimio Ohno became Professor of Quantum Chemistry at Hokkaido University, Japan in the Faculty of Science, Dept. of Chem.) Oct. 1964. From Jan. 1970 to July 1970 he was in the U.S.A. as Visiting Professor at Texas Tech. University. 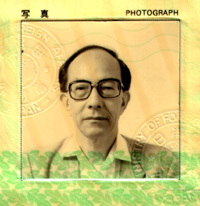 K. Ohno was elected Associate Director at the National Center for Science Information in April 1990. He has been Professor at Hokkaido Information University, April 1992 to March 2002, where he also served as its President from April 1999 to March 2002. The original J. Linderberg photograph, courtesy and © J.L., may be found here. Professor Fukashi Sasaki, Dept. Chem. Grad. Studies / Hokkaido Univ. There are quite a few joint publications of Kimio Ohno and Fubashi Sasaki (see List of Publications below). The following was taken as an example, presently (Apr. 28, 2002) only 4 pages of this were included. Simple Molecular Orbital Calculations on the Electronic Structure of Iron-Porphyrin Complexes. Theoret. Chim. Acta 1, 378-392 (1963). K. Ohno : Per-Olov Löwdin, Conqueror of Scientific, Educational and Rocky Mountains. in : Quantum Science - Methods and Structure. A Tribute to Per-Olov Löwdin. Edited by Jean-Louis Calais, Osvaldo Goscinski, Jan Linderberg and Yngve Öhrn. Plenum Press, New York, 1976, pages 1-11. K. Ohno also wrote a fairly detailed obituary for M. Kotani : In Memory of Professor Masao Kotani. Int. J. Quant. Chem. 53, 451-454 (1995). 1) T. Nakamura, K. Ohno, M. Kotani, and K. Hijikata, Interaction of pi-Electrons in the Acetylene Molecule, Progr. Theoret. Phys. 8, 387-400 (1952). 2) T. Itoh, K. Ohno, and M. Kotani, On the Valence Theory of the Methyl Radical, J. Phys. Soc. Jpn 8, 41-49 (1953). 3) M. Mizushima, K. Ohno, and A. Ohno, Theory of Intermolecular Potential and Second Virial Coefficient of Hydrogen at Low Temperature, J. Chem. Phys. 21, 2107-2114 (1953). 4) K. Ohno, Kinetic Theory of Gases pp.1-44 (in Japanese), (Kohbundo, Tokyo, 1954). 5) T. Itoh, K. Ohno and H. Yoshizumi, Non-Empirical Calculation of the Diamagnetic Anisotropy of Benzene, J. Phys. Soc. Jpn. 10, 103-107 (1955). 6) K. Takayanagi and K. Ohno, Collisions between Non-Spherical Molecules, I. - Molecular Collisions in Hydrogen Gas at Lower Temperatures -‚ Progr. Theoret. Phys. 13, 243-259 (1955). 7) K. Ohno and T. Itoh, Modified Atomic Orbital Method. I. The Electronic Structure of the Ethylene Molecule, J. Chem. Phys. 23, 1468-1472 (1955). 8) M. Kotani, E. Ishiguro, K. Takayanagi, K. Ohno, and T. Itoh, "Quantum Mechanics of Atoms and Molecules" (in Japanese), pp.1-294 (Iwanami, Tokyo, 1955). 9) T. Itoh and K. Ohno, Modified Atomic Orbital Method. II. The Electronic Strucutre of the Oxygen Molecule, J. Chem. Phys. 25, 1098 -1101 (1956). 10) K. Ohno, A Simple Semiempirical Method in Calculating Molecular Energies (in Japanese), Bull. Phys. Soc. Jpn. 11, 112-114 (1956). 11) K. Ohno, Appraisal of Moffitt‘s Method of Atoms in Molecules (in Japanese), Bull. Phys. Soc. Jpn. 11, 308-310 (1956). 13) K. Ohno, Y.Mizuno and M. Mizushima, Hfs of the H2S Molecule and its Electronic Structure, J. Chem. Phys. 28, 691-693 (1958). 14) K. Ohno et T. Itoh, Étude des Niveaux des Électrons pi de la Molécule d‘Éthylène et de la Molécule d‘0xygène par une Méthode Modifiée des Orbitales Atomiques, "Calcul des Fonctions d‘Onde Moléculaire" C.N.R.S., 73-82 (1958). 15) R. McWeeny and K.Ohno, A Quanturn Mechanical Study of the Water Molecule, Proc. Roy. Soc. A255, 367-381 (1960). 16) K. Ohno, Use of Electronic Computers in the Calculalion of Molecules (in Japanese), Bull. Phys. Soc. Jpn 15, 686-687 (1960). 17) M. Kotani, K. Ohno, and K. Kayama, Quantum Mechanics of Electronic Structure of Simple Molecules, Handbuch der Physik, Vol.37/2, pp.1-172 (1961). 18) A. Tsuchida and K. Ohno, "Bond Qrbital" and "Modified Electron-Pair" Calculations on the Ammonia Molecule, J. Chem. Phys. 39, 600-604 (1963). 19) F. Sasaki and K. Ohno, Spin Component Analysis of Single Determinant Wave Functions, J. Math. Phys. 4, 1140-1147 (1963). 20) K. Ohno, Y. Tanabe, and F. Sasaki, Simple Molecular Orbital Calculations on the Electronic Structure of Iron-Porphyrin Complexes, Theoret. Chim. Acta (Berl.) 1, 378-392 (1963). 21) K. Ohno, Some Remarks on the Pariser-Parr-Pople Method, Theoret. Chim. Acta (Berl.) 2, 219-227 (1964). 22) K. Ohno, The Present Status of the Theory of Molecular Electronic Structure - Semiempirical Methods - (in Japanese), Bull. Phys. Sec:. Jpn. 19, 772-774 (1964). 23) K. Ohno, The pi Electron Theories (in Japanese), BusSci, August issue, 383-390 (1965). 24) K. Ohno, Electronic Localization and Delocalization and Conjugation (in Japanese), Chemistry and Industry 18, 1269-1274 (1965). 25) K. Ohno, The Present Status of Calculations of Propertics of N2 and 02; The Middle Ultraviolet: Its Science and Technology (ed. by A. E. S. Green), John Wiley, New York, pp.73-82 (1966). 26) K. Ohno, Review on the Theoretical Research of Atoms and Molecules in Japan (in Japanese), Bull. Phys. Soe. Jpn. 21, 113 (1966). 27) K. Ohno, Molecular Orbital Calculations of pi-Electron Systems, Adv. in Quant. Chem. 3, 238-322 (1967). 28) H. Taketa, H. Tatewaki, 0. Nomura, and K. Ohno, Preliminary Calculations on Excited States of the Oxygen Molecule, Theoret. Chim. Acta. (Berl.) 11, 369-378 (1968). 29) K. Ohno, F. Sasaki, and Y. Horino, One-Diffuse and One-Tight Electron Modell for Atomic Electronic Structure (in Japanese), BusSci, January issue, 1-9 (1970). 30) K. Ohno, Calculation of Electronic Excitations of the FormaIdehyde and Pyrrole Molecules by the Pariser-Parr-Pople Method, The Jerusalem Symposia on Quantum Chemistry and Biology II, pp.l39-150 (1970). 31) H. Narumi and K. Ohno, On the Valence State Energy of the Carbon and Nitrogen Atoms, Bull. Chem. Soc. Jpn. 43, 1597-1598 (1970). 32) F. Sasaki, Y. Horino, and K. Ohno, The Effect of Removal of "Equivalence" Restrictions on the Electronic Energies of Atoms, Int. J. Quant. Chem. S5, 21-33 (1971). 33) 8. Kohda, K. Ohno, and H. Taketa, On the First Singlet and Triplet Excited States of the Lithium Molecule, Bull. Chem. Soc. Jpn. 45, 2737 -2738 (1972). 34) M. Takahashi, K. Tanaka, N. Honjo, and K. Ohno, Modified Electron-Pair Calculation on the Ground State of the Water Molecule with Acurate Integrals, J. Phys. Soe. Jpn. 38, 532-533 (1975). 35) T. Nomura, K. Tanaka, Arid K. Ohno, Preliminary Study on Quark Chemistry, J. Phys. Soc. Jpn. 38, 1471-1474 (1975). 36 K. Ohno, Quark Containing Molecules (in Japanese), Bull. Phys. Soc. Jpn. 30, 701-703 (1975). 37) M. Yoshimine, K. Tanaka, H. Tatewaki, 8. Obara, F. Sasaki, and K. Ohno, The Second 3 S 2 State of 02, J. Chem. Phys. 64, 2254-2255 (1976). 38) K. Ohno, Future Applications of Schrödinger‘s Equation in Chemistry (in Japanese), Kagaku 31, 432-436 (1976). 39 K. Ohno, Per-Olov Löwdin - Conqueror of Scientific, Educational and Rocky Mountains; Quantum Science (ed. by J. L. Calais, 0. GoScinski, J. Linderberg, and Y. Öhrn), Plenum, New York, pp. 1-11 (1976). 40) K. Ohno, Quantum Chemistry (in Japanese), Kagaku no Ryoiki 31, 280-281 (1977). 41) K. Ohno and T. Izayama, Professor J. C. Slater (in Japanese), Bull. Phys. Soc. Jpn 32, 534-537 (1977). 42) T. Noro, K. Tanaka, ancl K. Ohno, The Rydberg and Valence-Shell Characters of the Low-Lying Excited States of the Hydrogen Molecule, J. Phys. Soc. Jpn. 43, 1351-1357 (1977). 43) K. Tanaka, T. Nomura, T. Noro, H. Tatewaki, T. Takada, H. Kashiwagi, F. Sasaki, and K. Ohno, Ab initio SCF CI Calculations on the Ground and pi -pi * Excited States of the Pyrrole Molecule and its Positive Ion, J. Chem. Phys. 67, 5738-5741 (1977). 44 K. Ohno, Quantum Chemical Computations - Personal Appraisal of the State of the Art, Int. J. Quant. Chem. 12S, 119-125 (1977). 45) K. Ohno, Introduction to Quantum Chemistry Data Base (in Japanese), Prog. Rep. By Res. Group QCPI3 1, 1-4 (1978). 46) N. Shimakura, H. Inouye, N. Honjou, M. Sagara, arid K. Ohno, Valence Full Configuration Interaction Calculation of the CN+ Ion, Chem. Phys. Lett. 55, 221-225 (1978). 47) N. Honjou, K. Tanaka, K. Ohno and H. Taketa, Configuration Interaction Calculation of the O2+ Ion and Study of the Photoelectron Spectra of O2, Mol. Phys. 35, 1569-1578 (1978). 48) H. Kashiwagi, T. Takada, S. Obara, E. Miyoshi, and K. Ohno, Ab initio Molecular Orbital Calculations of the Cobalt-Porphine Complex. I. LCAO SCF MO Calculation of Low-Spin, High-Spin, and pi -Ionized States of Co-Porphine, Int. J. Quant. Chem. 14, 13-27 (1978). 49) K. Ohno, On the Quantum Chemistry Data Base (in Japanese), Prog. Rep. by Res. Group QCDB 2, 1-4 (1979). 50) T. Takada and K. Ohno, Ab initio LCAO MO SCF CI Calculation on the Electronic Structure of the Cyclopropenyl Cation, Bull. Chem. Soc. Jpn. 52, 334-338 (1979). 51) H. Tatewaki, K. Tanaka, F. Sasaki, S. Obara, K. Ohno, and M. Yoshimine, Configuration-Interaction Study of Lower Excited States of O2: Valence and Rydberg Characters of the Two Lowest 3 S u- States, Int. J. Quant. Chem. 15, 533-545 (1979). 52) N. Honjou, T. Noro, M. Takagi, K. Ohno and M. Makita, Ab Jnitio Configuration Interaction Calculation of the Low-Lying Electronic States of CaH Molecule, J. Phys. Soc. Jpn. 48, 586-590 (1980). 53) K. Ohno, Ab initio Computations of Metal-Porphine Complexes; Horizons of Quantum Chemistry (ed. by B. Pullman and K. Fukui), Reidel Dordrecht, pp.245-266 (1980). 54) K. Ohno, Development of Quantum Chemistry Data Base (in Japanese), Prog. Rep. hy Res. Group QCDB 3, 1-3 (1980). 55) K. Ohno, Ab initio Computations of Metal-Porphine Complexes; Water and Metal Cations in Bioiogical Systems (ed. by B. Pullman and K. Yagi), Jpn. Sci. Soc. Press, Tokyo, 147-154 (1980). 56) Y. Osamura, S. Yamabe, F. Hirota, H. Hosoya, S. Iwata, H. Kashiwagi, K. Morokuma, M. Togasi, S. 0bara, K. Tanaka, and K. Ohno, QCLDB - Quantum Chemistry Literature Data Base - A Trial, Int. J. Quant. Chem. 18, 393-396 (1980). 57) E. Miyoshi, T. Takada, S. Obara, H. Kashiwagi, and K. Ohno, Theoretical Study of Excitation Energies of Some CoF6n- Complexes, Int. J. Quant. Chem. 19, 451-461 (1981). 58) Y. Osamura, 5. Yamabe, F. Hirota, H. Hosoya, S. Iwata, H. Kashiwagi, K. Morokuma, M. Togasi, S. Obara, K. Tanaka, and K. Ohno, Quantum Chemistry Literature Data Base, J. Chem. Inf. & Comput. Sci. 21, 86 (1981). 59) K. Ohno, Quantum Chemistry Data Base - Its Past, Present, and Future (in Japanese), Prog. Rep. by QCDB Res. Group 4, 1-5 (1981). 61) N.Honjou, M. Takagi, M. Makita, and K. Ohno, Theoretical Study of the Low-Lying Electronic States of CaH, J. Phys. Soc. Jpn. 50, 2095-2100 (1981). 62) K. Ohno, Foundation of Theory of Atomic and Molecular Structure (in Japanese), Mathematical Sciences, No.222, 9-14 (1981). 63) K. Ohno, Infant Period of the QCDB Group (in Japanese), Prog. Rep. by QCDB Res. Group 5, 1-7 (1982). 64) F. Kawai, T. Noro, A. Murakami, and K. Ohno, Comparison of the Equilibrium Geometry of Acetylene (C2H2) and Disilyne (Si2H2), Chem. Phys. Lett. 92, 479-482 (1982). 65) K. Ohno and K. Morokuma, Quantum Chemistry Literature Data Base - Bibliography of Ab Initio Calculations for 1978-1980 ‚ Elsevier Sci. Pub., Amsterdam, (1982). 66) E. Miyoshi, S. Obara, T. Takada, H. Kashiwagi, and K. Ohno, Theoretical Study of Degree of Covalency in Some CoF6(n-) Complexes (n = 4, 3, and 2), Int. J. Quant. Chem. 23, 1753-1765 (1983). 67) N. Shida, K. Tanaka, and K. Ohno, An Ab Initio Calculation of Symmetric Bending and Stretching Vibrational States of H3O+ and D30+ Ions, Chem. Phys. Lett. 104, 575-578 (1984). 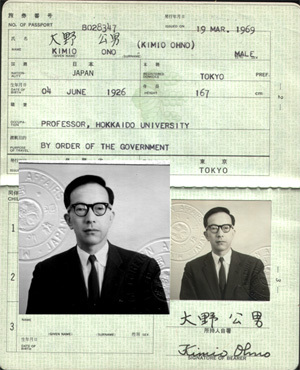 68) K. Ohno, Professor Masao Kotani, Int. J. Quant. Chem. 18S, 1-9 (1984). 69) K. Ohno, Introduction (Ab Initio Approaches to Biomolecules), in Biomolecules - Electronic Aspects (ed. by C. Nagata et al. ), Jpn. Sci. Societies Press, Tokyo, pp.3-7 (1985). 70) K. Ohno, Concluding Remarks and Future Trends (Ab Initio Approaches to Bio-Molecules), in Biomolecules - Electronic Aspects (ed. by C. Nagata et al. ), Jpn. Sci. Societies Press, Tokyo, pp.105-106, (1985). 71) M. Togasi and K. Ohno, Quantum Chemistry Data Base - QCDB - (in Japanese), in Front of Quantum Chemistry, in Kagaku, Kagaku Dojin, Kyoto, pp.219-225 (1985). 72) K. Ohno and T. Noro, Electronic Structure of the Benzene Molecule (in Japanese), in Molecular Science Series No.5, Electronic States of Molecules, Kyoritsu Puhl. Co, Tokyo, pp.83-1O1 (1986). 73) T. Shoda, T. Noro, T. Nomura, and K. Ohno, The Electronic Structure of Low-Lying Excited States of Two Model Systems of Retinal, Int. J. Quant. Chem. 30, 289-302 (1986). 74) K. Ohno, Japanese Supercomputers and Molecular Orbital Calculations, in Supercomputer Simulations in Chemistry (ed. by M. Dupuis), Springer-Verlag, Berlin, pp.49-53 (1986). 75) N. Shida, K. Tanaka, and K. Ohno, An Ab initio Calculation of Vibrational States of the H3O+ Ion; Applied Quantum Chemistry (ed. by V. H. Smith et al. ), D. Reidel Publ. Co., Dordecht, pp.421-430 (1986). COLOR="#0000ff">Ab initio SCF-CI Calculation on Free Base Porphine and Chlorine; Theoretical Analysis on Intensitics of the Absorption Spectra, J. Chem. Phys. 85, 4524-4529 (1986). 77) K. Tanaka, M. Mochizuki, T. Kawaguchi, H. Tatewaki, and K. Ohno, Theoretical Study of the Electronic Structure of CO Adsorbed on Small Cu Clusters in Microclusters (ed. by Y. Nishina et al. ), Springer-Verlag, Berlin, pp.82-86 (1987). 78) N. Shida, K. Tanaka, and K. Ohno, A Theoretical Study of Rotation-Vibration Levels of the Lower Two 2 S + States of the CaH Molecule, J. Mol. Spectry. 121, 283-293 (1987). 79) F. Sasaki, K. Tanaka, T. Noro, M. Togasi, T. Nomura, M. Sekiya, T. Gonoi, and K. Ohno, A Data-Oriented CI Program System, Theoret. Chim. Acta 72, 123-138 (1987). 80) K. Ohno, Supercomputer and Molecular Science (in Japanese), in Japanese Scientific Monthly 41, 149 (1988). 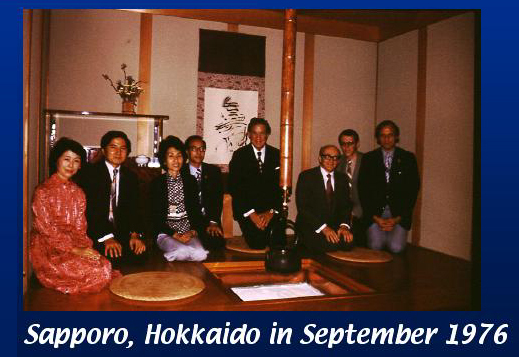 81) H. Iwaki, T. Noro, and K. Ohno, Ab-initio Calculation of Resonance States of H2O, Intern. J. Quant. Chem. 33, 567-576 (1988). 82 P. K. Mukherjee, K. Ohtsuki, and K. Ohno, Dynamic Polarizabilitics and Rydberg States of Open Shell Atomic Systems, Theoret. Chim. Acta 72, 431-444 (1988). 83) Y. Yamamoto, T. Noro, and K. Ohno, Composite Natural Orbitals for Configuration Interaction Method, Coll. Czechoslovak Chem. Commun. 53, 2266-2278 (1988). 84) D. R. B. Kundu, P. K. Mukherjce, K. Ohtsuki, and K. Ohno, Time-dependent Perturbation Calculation for the Doubly Excited States in Two-Electron Systems, Phys. Lett. 136, 423-427 (1989). 85) Y. Mochizuki, K. Tanaka, and K. Ohno, Electronic Structure of CO Adsorbed on Small Cu Clusters: Theoretical Study on Excited States, Phys. Rev. B39, 11907-11913 (1989). Copyright © Mar. 15, 2002 by U. Anders, Ph.D.